With an increasingly ageing population, the growth in individuals living with long-term health conditions and the shortages of qualified nurses and residential care workers, there is extra demand and pressure on health and social care resources. To maintain high levels of care, we need to look for new methods to support us and our wellbeing. Technology can address some of these issues by providing additional assistance and resources, not to replace human contact and care altogether. “Robots can be used as assistive technologies, and form part of an emerging market with increasing impact; from supporting patients cognitive abilities to providing remote monitoring of their health status and support in activities of daily living. Our project has been working with Pepper as the most advanced humanoid robot currently available on the market – with others sure to follow. Thanks to his voice recognition system and exceptional artificial intelligence, he is capable of maintaining a conversation. Pepper is capable of identifying your emotions, such as joy, sadness, anger or surprise, and can adjust his behaviour according to your mood. So if you're having a bad day, he can tell you a joke, sing you a song, or even dance to your favourite tune to cheer you up! In time there will be more humanoid robots available, who will help us in activities of daily living, such as reminding us to take medication, guiding us in unfamiliar places, or encouraging us to eat healthier and exercise. In 2008, the French company Aldebaran-Robotics introduced to the world the humanoid robot NAO; a performant biped robot - the first of his generation. With a height of 57cm, this robot has been available and affordable for research laboratories and the mass market. NAO has been used in different research studies including the healthcare sector. 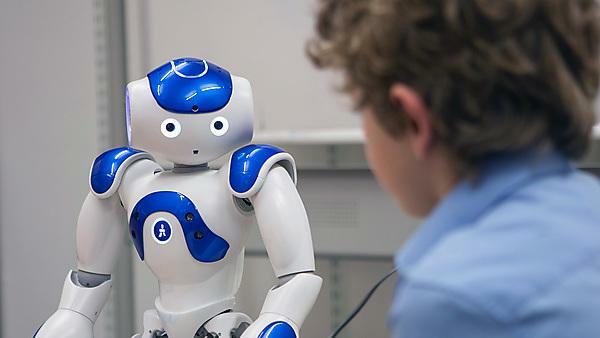 For instance, studies of the benefits of using NAO for interaction therapy and social engagement with autistic children have been carried out. The result speaks for themselves; this humanoid robot shows a higher frequency of motor initiations in their interactions. More humanoid robots such as Pepper and NAO will become available on the market, as more companies design and adapt these technologies. We hope that this drives the price down and enables the widespread purchase to extend to support caregivers in their day to day activities. The benefits of companion pets are thought to be based on ‘pet therapy’ or animal-assisted therapy. However, introducing live animals into care homes can be problematic. Using robotic companion pets can be a solution. PARO is a robotic seal developed in Japan and has been shown to reduce both agitation and depressive symptoms in older adults with cognitive decline. He can modify his behaviour to suit the user and combines animal therapy with an advanced interactive system. PARO has been found to reduce patient stress and improve relaxation. PARO costs more than £5,000 in the UK, making him unaffordable for care homes and individuals. EPIC is now supporting an initiative in Cornwall that is developing alternative, cheaper companion robots so more people can benefit. The project uses insight from research at the University of Plymouth. To support innovation at a start-up robotic company in Cornwall. MiRo is one of a new generation of biomimetic autonomous companion robots, a pet for those who are unable look after a real animal. He will share our personal space, interact with us and other MiRo robots providing emotional engagement and entertainment. He is engaging and charming, and is always trying to communicate with people around him. He also offers functions to monitor the safety of the user, by using his camera and tracking data. As an active therapeutic robot, he encourages movement to help the user maintain an active lifestyle while petting a fantastic pal. Paro and Miro are the best robotics examples of companion robots. Nevertheless, due to their high cost and availability in the market, they might not be the best option for all. Other alternatives for them are the Joy for All Cat and Dog developed by the American company Hasbro. Despite being toys rather than traditional robots, they have proved their ability to engage with their user and bring them comfort and joy. Intelligence assistants use the power of artificial intelligence and the internet to provide an organic way of accessing information and delivering services. Smart speakers are equipped with voice recognition and can respond to natural language commands. Apps, websites and data sources could also be accessed via these smart speakers which adds additional value for those who are not skilled at using digital devices as they can access via voice commands. Patients can use the devices to remind them to take medication, or deliver information such as needle collection as well as ease of managing calendars for appointments and renewing prescriptions. The use of voice-activated devices in the home can also enable people with mobility, sight or dexterity issues to turn on other devices such as lighting, music and entertainment devices using speech. Amazon Echo (Alexa) and Google Home are already on sale with Apple and Microsoft set to follow. Telepresence robots can be thought of as embodied video conferencing on wheels. These remote-controlled systems allow a user to virtually visit places and interact with the environment through its sensorial and motor capabilities. They can be used in a wide variety of situations, from ad-hoc conversations at the office, inspections, and troubleshooting at factories, to patient rounds at medical facilities or visiting family in eldercare centers. This robotic market is booming offering to users a different range of sizes, features, and prices. PadBot is one such Telepresence robot the EPIC project has been showcasing, like other robots of this type it dramatically enhances the experience of human communications, enabling calls to loved ones using a smartphone or tablet, with the ability to move around using the robot. It brings monitoring to a whole new level and becomes your remote home window. The robot is ideal for supporting independent living, reducing the burden of carers, and to give reassurance to family members, as they can check in using remote settings with ease. You can call the robot from your home or office, in your free time, or when you just want to check how things are. Move the robot around your loved ones' home and interact with them. These type of robots enable you to connect you with those that matter the most to you. Virtual Reality (VR) is a computer simulation of a three-dimensional (3D) environment that can be interacted with in a seemingly real way by using a Virtual Reality headset. These can be used through smartphones and apps making them accessible to many, without incurring a large expense, or there are specially designed immersive consoles that are available, but perhaps not for use in the home. Users can experience activities that they have enjoyed previously but can no longer take part in, haven’t encountered before due to physical restrictions, or as a learning tool. Children who may have a fear or anxiety of going to hospital can have a VR experience to know what to expect through apps such as Little Journey. Depression, fear and anxiety symptoms can be elevated through distraction and relaxation, by immersing in calm and peaceful environments. To combat social isolation, for patients with physical disabilities, long term health conditions, frailty, and even dementia. Patients with Autism can use the technology to help develop skills to promote independence. Healthcare professionals can use VR to learn new skills without causing danger to patients, for example medical and surgical training. Apps and mobile health (mHealth) are an area of eHealth, specifically being the provision of health services and information via mobile technologies. There are now 325,000 mHealth apps available through Google play and Apple app store. There are various bespoke apps for managing different areas of health; exercise, nutrition, mental health, diabetes, Chronic Obstructive Pulmonary Disease (COPD) and cardiovascular diseases. The NHS has launched a digital apps library which is under beta testing and has been designed to showcase a number apps. The new health secretary has called for the development and use of more apps to support the NHS. The potential benefits from using apps appears endless, especially when more apps are created, used, improved and trusted. From cutting down on unnecessary appointments, sharing data with primary health practitioners to putting patients at the centre of their own care - Apps are seen as a game changer for the future of health and care delivery.